The preparedness of the Nigerian Ports Authority (NPA) to workplace emergency has been greatly enhanced with the acquisition of effective and modern firefighting equipment as well as the periodic training of the officers and men of the Health Safety and Environment Division (HSE). This enhanced preparedness and performance of the NPA Emergency Response Team was demonstrated yesterday when the team undertook a drill at the Corporate Headquarters building of the Authority, along Marina, Lagos. During the drilling exercise, which forced all the occupants of the Headquarters building to evacuate their various offices to the designated muster points, the firemen deployed their newly acquired firefighting equipment and skills to demonstrate how to contain fire situation on the main building. At the end of the exercise, General Manager, Health, Safety and Environment (HSE), Mallam Ahmed Yusuf who described the drill as “very successful”, said a total of 8 minutes was spent to evacuate the 7-storey Headquarters building by the occupants as against 10 minutes as was recorded last year during a similar exercise. He explained that in this year’s exercise, there was no record of malfunctioning of any equipment, adding that the sky-lift fire engine and firefighting equipment were functional. The General Manager also added that an evacuation of a casualty in a smoked office was simulated during the exercise and was safely transferred into an ambulance for transmission to the hospital, reflecting a real life situation. Yusuf acknowledged the existing collaboration and good working relation between the Department and the Lagos State Agency for Safety and Emergency. He charged all Port Users and Stakeholders to ensure that all necessary facilities are put in place towards the protection of lives and property especially from fire destruction. The safety helmsperson further stated that the evacuation drill was meant to achieve amongst others, the HSE Division’s preparedness to respond to workplace emergencies like fire, flood, toxic gas release, civil disturbance, bomb and any other workplace emergency that may arise and create awereness for swift response to such emergencies, as well as Assess Feedbacks from the workplace for greater efficiency. 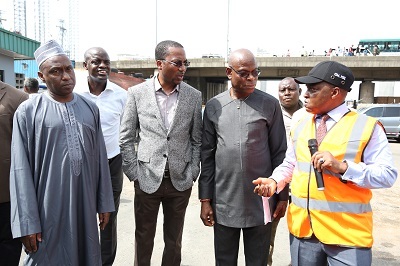 Present at the muster point were the Executive Directors, Engineering and Technical Services, Prof. Idris Abubakar, Finance and Administration, Mohammed Bello-Koko and the General Manager, Finance, Chief Simon Aniobi amongst other officers and staff of the Authority.